The smokestacks of the Navajo Generation Station rise 775 feet from the sere landscape of the Navajo Nation in northern Arizona, just three miles away from the serpentine, stagnant blue wound in sandstone known as Lake Powell. Red rock cliffs and the dark and heavy hump of Navajo Mountain loom in the background. Since construction began in 1969, the coal plant and its associated mine on Black Mesa have provided millions of dollars to the Navajo and Hopi tribes and hundreds of jobs to local communities, as well as electricity to keep the lights on and air conditioners humming in the metastasizing cities of Phoenix, Tucson, Las Vegas and Los Angeles. Yet they’ve also stood as symbols of the exploitation of Native Americans, of the destruction of the land, and of the sullying of the air, all to provide cheap power to the Southwest. But coal power is no longer the best energy bargain. And on Monday the plant's four private utility owners, led by the Salt River Project, voted to shut down the plant at the end of 2019, some 25 years ahead of schedule. When the giant turbines come to a halt and the towers topple in the coming years, the plant will become a new symbol, this one of a transforming energy economy and an evolving electrical grid that is slowly rendering these soot-stained, mechanical megaliths obsolete. The Navajo Generating Station in northern Arizona with Lake Powell in the background. The closure will deeply wound local economies, particularly in Page, LeChee, Kaibeto and Kayenta. • 935 — Full-time employees in 2014 of Navajo Generating Station, the Kayenta Coal Mine on Black Mesa, which exists only to fuel the plant, and the 78-mile electric railroad that carries coal from the mine to the plant. • 90 — Percent of those workers that are Native American. In addition to these jobs, both mine and plant have contractors for various purposes and each of the power plant’s three units requires a major overhaul every three years, which temporarily employs an additional 400 or more people. These are highly coveted jobs here on the Navajo Nation, which deals with high unemployment and chronic poverty. 2. The operating budgets of the Navajo Nation and the Hopi tribe will take a severe beating. Both the Hopi and Navajo tribes got the short end of the stick — a royalty rate of just 3.3 percent — when Peabody Coal first got the leases to mine Black Mesa in the 1960s. The attorney representing the Hopi tribe, John Boyden, was actually on Peabody’s payroll at the time, and managed to get a sham tribal government to sign over mining rights against the objections of traditional Hopis, as chronicled by writer and law professor Charles Wilkinson. The mines — Black Mesa and Kayenta — forced families to relocate, destroyed grazing land, dried up springs and wrecked ancestral Hopi shrines and other sites. The tribes fought back and eventually negotiated better terms. Both tribes now rely heavily on royalty and lease payments from the mine and the power plant, even as tribal members fight against the polluting and water-gulping ways of plant and mine. • $54 million — Total annual royalties, bonus payments and water-use fees paid to the Hopi tribe and the Navajo Nation as of 2015 by the owners of both the Navajo Generating Station and the Kayenta Coal Mine. The Hopi tribe depends on these payments for more than 80 percent of its total budget. This amount would have gone up considerably after 2019. • $1.7 million — Approximate amount donated yearly by Peabody Western Coal Company and Salt River Project — the plant’s operator — on local scholarships and charity. • $9.9 million — Cost of electricity purchased by the Kayenta Coal Mine yearly from the Navajo Tribal Utility Authority. Prior to Monday's announcement, the plant's owners and the Navajo Nation were refashioning the lease, which runs out in 2019, to make it more favorable for the tribe. Peabody also hoped to expand the mine. 3. The air (and water and land) will be a lot cleaner without Navajo Generating Station, one of the biggest polluters in the West. • 20 million metric tons carbon dioxide equivalent — Amount of greenhouse gases emitted by the power plant (carbon dioxide) and the mine (methane) each year. • 8.6 million metric tons CO2 — Amount of greenhouse gases emitted yearly by a natural gas plant generating the same amount of electricity as the Navajo Generating Station. This does not account for leaks during natural gas production, processing, transportation and storage. • 472, 4370, 259 — Pounds of mercury, selenium and arsenic, respectively, that spew from the power plant’s smokestacks each year. These elements are toxic to wildlife and humans and have shown up in relatively high concentrations in fish in the Grand Canyon and the San Juan River upstream from Lake Powell, as well as in precipitation at Mesa Verde National Park. Natural gas combustion emits only negligible amounts of these elements. • 1.3 million — Tons of coal combustion waste produced by the plant each year, about 75 percent of which is disposed of nearby, with the rest sold for use in other applications. 4. The plant lies at the heart of the water-energy nexus. Both the Kayenta Mine and the Navajo Generating Station use large amounts of water. The Bureau of Reclamation owns a large share of the plant, and uses most of its electricity to run the pumps for the Central Arizona Project, which delivers Colorado River water to Arizona cities. • 1,200 acre feet — Amount of groundwater the mine draws from the Navajo Aquifer each year. (Prior to the 2005 closure of the Mohave Generating Station, another 3,000 acre feet was used to slurry the coal 273 miles from the mine to the plant, drying up important springs in the area). • 28,000 acre feet (9 billion gallons) — Amount of water drawn from Lake Powell each year for steam generation and cooling at the plant. This is all consumptive use, meaning none of this water is returned to the source. • 3 million megawatt-hours — Amount of electricity the CAP uses to lift, transport and deliver 1.6 million acre feet of Colorado River water to Phoenix and Tucson annually. (Enough to power about 240,000 Arizona homes for one year). 5. Economics, not the so-called war on coal or federal environmental protections, is the primary factor shutting down the plant. Salt River Project officials have been very clear on this point. They note that it’s now cheaper for them to buy power for their 1 million customers from other sources than it is to generate power at Navajo, thanks mostly to low natural gas prices. A November 2016 study by the National Renewable Energy Laboratory found that the Central Arizona Project pays about 15 percent more for electricity from the power plant — of which it is part owner — than it would if it bought power wholesale from the Mead trading hub located near Las Vegas. None of this will change even if President Donald Trump rolls back the Clean Power Plan or other regulations put in place by the Obama administration. In fact, if a drill-heavy energy policy is put into place, it will increase natural gas supplies, thus increasing the spread between natural gas and coal. Having said that, California’s move away from coal power lowers the value of the plant’s power, and the requirement that the plant install nitrous oxide-reducing equipment increases costs — so environmental protections do play a role, albeit a smaller one than economics. 6. It’s a sign of the times. Although it’s happening slowly, the electrical landscape is evolving. The days of vertically integrated utilities that own huge, centralized power stations and their own balkanized grids are giving way to a new era in which utilities purchase power generated by smaller plants that are connected to larger, regional grids. California’s independent grid operator has already joined up with NV Energy, PacifiCorp and other Western utilities to form an energy imbalance market, which allows the utilities to share generators — be they wind, solar, natural gas or coal — to “balance” their grids in real time, rather than having to rely only on their own generators. These utilities are hoping to expand this market and then take it to the next level of a regional, integrated grid in coming years. 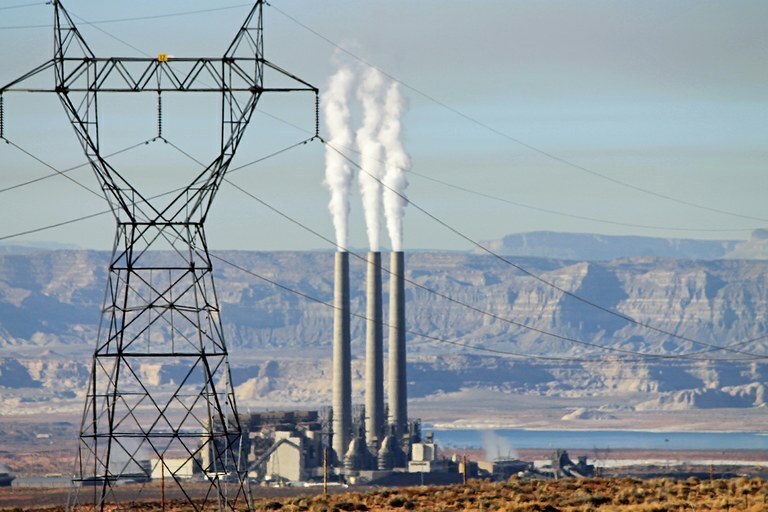 The closure of Navajo Generating Station adds new urgency to this effort. The decision to close the plant came as a surprise. Until several weeks ago, the plant’s owners were negotiating a new lease with the Navajo Nation and considering shutting one of three units and replacing it with other energy sources. Meanwhile, the mine was looking to expand. Outright closure this soon was not on anyone’s radar, so there is no firm transition plan in place. The Bureau of Reclamation and Peabody are looking for ways to keep the plant running beyond 2019, but they'd have to do it without the other owners and against economic headwinds. There are little or no such credits available for Navajo Generating Station, however, so that approach won’t work here. The owners of the plant could work with the tribes to replace some of the lost electricity generation by building new solar, wind or other plants on the reservations, where there is ample potential for renewable energy development. Two major transmission systems are associated with the plant, and could be taken over by the tribes to move solar or wind power to the south and west. The water rights could be turned over to the tribes, for use in agriculture or other purposes.